We’d like to think our Harvest Chicken Salad is a taste of fall in a bite: crisp juicy apples, bacon, sweetly glazed walnuts and just the right amount of zing from an apple cider vinaigrette. It’s Sunday night. You’ve cleaned up the kitchen after cooking dinner, you need to make the kid’s lunches…and pack your lunch…and get to all those other to-dos. Not to mention, you know, squeezing in some Sunday night TV. Well, we have a suggestion to get you to your binge-worthy watch list sooner: instead of packing your lunch for Monday, get yourself to your closest Wendy’s. You see, our new Harvest Chicken Salad is here and yes, it tastes like all those delicious fall things we love – crisp juicy apples, bacon, sweetly glazed walnuts and a zing of flavor from the apple cider vinaigrette. But the best part? It’s a simple and balanced option, opposed to packing your lunch or heading for the nearest vending machine for those not-so-nutritious options. Just hop in your car for quick and flavorful lunch that packs in fruit, vegetables and protein. We like to say this is #foodgoals. Seriously, with two cups per serving, its never been easier to sneak in daily fruits and vegetables. And since fall is filled with indulgent food (Halloween candy, don’t tempt us!) it’s nice to have a little something to help you stay on track. Wendy’s Harvest Chicken Salad is truly a savory, fresh choice that lets you have it all: flavor, texture and nutrients to fuel your busy day. You can still fix that fall flavor craving, minus that not-so-desirable sugar crash. While there’s no shame in the drive-thru game, sometimes it’s easier to order in. Thankfully, Wendy’s and DoorDash’s partnership makes salad delivery easy. 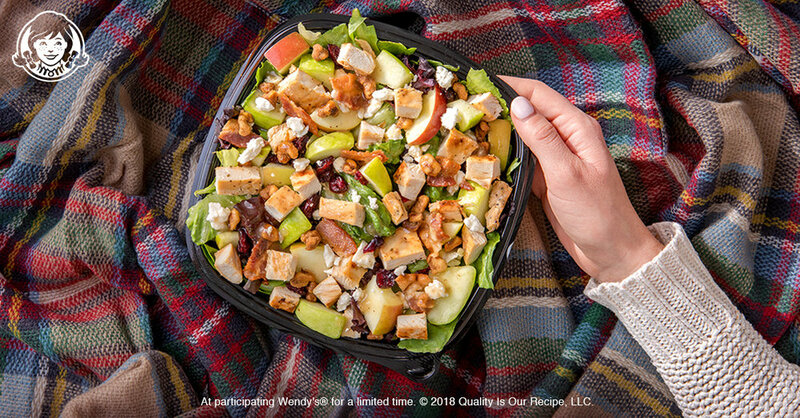 Use Wendy’s delivery to have the Harvest Chicken Salad delivered right to your door. Plus Wendy’s has sweetened the deal: through 12/2 your DoorDash order of $10 or more is delivered for free Friday through Sunday*. * DoorDash delivery available only in select markets at participating restaurants. Prices may be higher than in restaurant. See Doordash.com for details.